The purpose of this project is to promote and raise awareness of library projects that incorporate role-playing games. The project aims to provide resources, ideas, and networking for librarians and volunteers who would like to host role-playing programs at their library. Wizards of the Coast, publishers of the Dungeons & Dragons RPG, has a program called Afternoon Adventures with Dungeons & Dragons. This project would build upon that idea, providing options to run other RPGs (for those who prefer them over D&D, or for situations where the D&D name may attract a negative response), and providing further support for anyone involved in such a program (including the D&D program). This information and news page. A discussion subforum in the Escapist forums. Articles and tips on organizing such a program - making flyers, posters, and handouts, setting schedules, and more. Articles and tips on maintaining, and troubleshooting such a program - keeping the players interested and coming back, dealing with any objections to the program, and more. Articles on source material - how to tie an adventure in with literature available at the library, making recommended reading lists for your adventures, running games that tie in with popular movies and television shows, and more. Features on participating libraries - the people involved, what games they play, the response they have received, and more. Creating an "RPG Library Day," much like Free Comic Book Day or Free RPG Day, to help raise awareness. Distributing flyers and information at library conventions, or possibly even setting up a booth at them. News & events relating to libraries and role-playing. Once you've squeezed all the fun you can out of computer-driven fun this Christmas vacation week, consider kicking it with a bit of imagination at the Nashua Public Library. 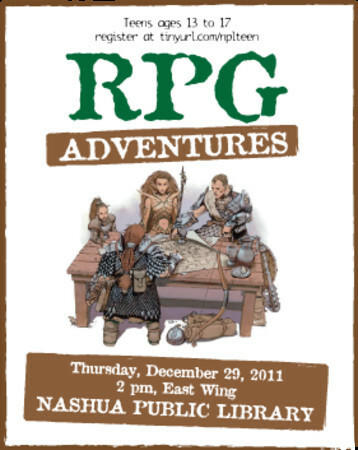 On Dec. 29 bring a friend to the library to discover RPG – Role Playing Game – Adventures. Perfect for anyone who's ever turned a bed sheet into a superhero cape. For ages 13 to 17. Are you running an RPG club or event at a library? Be sure to let me know about it! Dungeons & Dragons for ages 6 and up - To help promote their upcoming novel Monster Slayers, Wizards of the Coast has put together Monster Slayers: The Heroes of Hesiod, a stripped-down version of Dungeons & Dragons that's fast, fun, and playable by adventurers as young as six. Best of all, it's completely free! The game itself is a very simple version of the D&D combat rules (so simple that they could have come from any previous edition), and the adventure that's included doesn't involve a lot of actual role-playing, but any good Dungeon Master will be able to draw that out of the players with a little effort. To play, you'll need a copy of the PDF, pencil and paper, a d20 and d6 (or three d6s if you don't have any d20s lying around), and some adventurous friends. NATIONAL GAMING DAY @ YOUR LIBRARY IS COMING SOON - It's that time of year again - National Gaming Day @ Your Library will happen in a little more than a month, on November 14th of this year. Libraries all over the country will be participating, hosting events of board games, video games, and even some tabletop RPGs - though in many cases, roleplaying games are underrepresented, or not present at all. This will be an excellent opportunity to promote roleplaying games to new and experienced players, to raise awareness of what they are and how much fun they can be, and even gauge interest in potential RPG clubs at the library. If you are a librarian who would like to participate, be sure to visit ngd.ala.org, and if you are a non-librarian who would like to volunteer, contact your local library and offer your services! 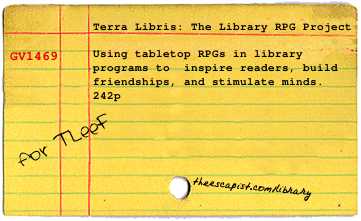 And as always, whenever you host any kind of RPG event at a library, let me know about it, and I'll promote it here on the Terra Libris page. MORE FROM LIZ DANFORTH - Over on libraryjournal.com, Liz Danforth has posted a new piece on roleplaying games in the library Don't miss it! LIZ DANFORTH INTERVIEW ON GROGNARDIA - I've been a fan of Liz Danforth's art for a very long time, and even had the honor of meeting her at a convention in 2002. She is a very classy lady, and one of our hobby's true treasures. MAKING THE CASE FOR GAMING @ YOUR LIBRARY - The ALA's Library Gaming Toolkit website has released an excellent page of resources for advocating games in libraries - Making the Case for Gaming @ Your Library. How good is it? Well, it links to The Escapist and calls it an "excellent advocacy resource." So that should give you a pretty good idea. TEN LIBRARY GAMING GRANTS ANNOUNCED - The American Library Association plans to give away ten $5,000 grants to libraries that want to develop and implement "literacy gaming services" for young people. 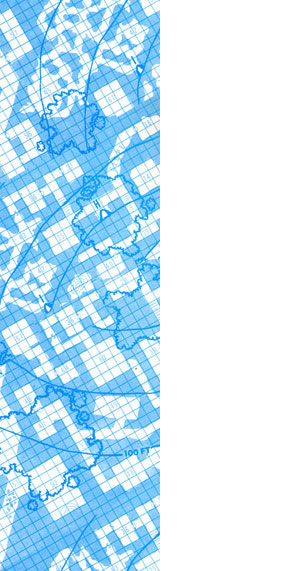 CHICAGO – The American Library Association (ALA) Office for Literacy and Outreach Services is seeking applications from public, school and academic libraries interested in developing and implementing innovative literacy gaming services for youth ages 10-18. This program is part of ALA’s Libraries, Literacy and Gaming initiative funded by Verizon. “There is no doubt that gaming and literacy go hand-in-hand. Board and video games come with text of all kinds including instructions, menus and much more. Learning the language and mechanics of any game, from chess to Little Big Planet, involves acquiring a new vocabulary and a new set of 21st century literacy skills,” said Dale Lipschultz, Literacy Officer, Office for Literacy and Outreach Services. On Nov. 15, hundreds of libraries across the country celebrated the ALA’s first annual National Gaming Day @ your library. Libraries of all types joined in the celebration by registering for two national gaming activities: a national video game tournament and board game challenge. Genesee Valley BOCES Library System has produced a landmark document (sls.gvboces.org/gaming/standards) that relates board gaming to the American Association of School Librarians Standards for the 21st-Century Learner (ala.org/ala/mgrps/divs/aasl/aaslproftools/learningstandards/standards.cfm). While these standards were established for board games, the document should be used as a model for making a case for tabletop RPGs. Each of the four standards can be directly addressed by playing RPGs. Players think critically and analyze information, make informed decisions and apply knowledge to new situations when interacting with the game’s setting and cultures, share knowledge and weigh moral consequences of their actions, and participate in creating stories that last beyond the end of the session. By addressing these standards and demonstrating the direct link between gaming and learning, RPGs can gain support from administrators and teachers. The article also includes some basic tips on where to find RPG materials, and how to find assistance and ideas online. You can read it here, and it will be added to the list of Terra Libris resources. Personally, I'd rather they separate D&D and M:tG, just to get a clearer number that we can try to beat next year. You can read the full post here, which includes lots of anecdotes from libraries all over the United States. 11/15/08 IS NATIONAL GAME DAY @ YOUR LIBRARY - This Saturday, libraries all over the United States will be participating in National Gaming Day, an effort to raise awareness about the use of games in library programs, expose people to new kinds of games, and enable networking between game clubs and libraries. The focus seems to be primarily on video and board games, but Wizards of the Coast has donated copies of Dungeons & Dragons to help promote the event. This would be an excellent time to contact your local library about organizing a roleplaying program - it may be too late to prepare one in time for Saturday, but most libraries would love to have volunteers the rest of the year. Afternoon Adventures with Dungeons & Dragons, Wizards of the Coast's library program. Also check out their Wizards Play Network. Azor Lok - A blog by a librarian who makes frequent posts on playing D&D in the library. Blusponge - A blog by Tom, who runs RPGs at the Lewisville Public Library in Lewisville, TX. Gaming News from ALA, the ALA's blog on games in the library. Games and Gaming Resources, the ALA's wiki on games in the library. Games in Libraries, a podcast about games, gaming, and gamers in libraries. Gaming in Libraries course - a series of YouTube videos of a course on games in libraries. Lewisville Public Library Roleplaying - blog for a library in Texas that regularly hosts many roleplaying events, and even some miniature painting seminars. Two fantastic resources are available here - a Power Point presentation on running RPG events in libraires and a PDF guide to RPGs for library use. Don't miss them! LibGaming - A Google discussion group on all aspects of gaming in libraries. Phantasm - A gaming convention held in a library in Peterborough, Ontario, Canada. Tabletop Fantasy RPGs - Tips for introducing role-playing games in your library - School Library Journal, January 2nd, 2008. Night of the Dragonslayers - Times Argus, March 23rd, 2008. The Ilsey Public Library in Vermont hosts an all-night Dungeons & Dragons marathon. Dungeons & Dragons at the Library, Wired GeekDad, September 22nd, 2008. Start a Dungeons & Dragons campaign @ your library. It's easy! - yalibrarian, February 26th, 2008. Older listings are retained for some time after the event has passed, to give readers the opportunity to contact the library about future events. NOTE: The libraries and groups on this list are in no way affiliated with The Escapist. Lewisville Public Library Lewisville, TX Teen Roleplaying Program: Free and open to ages 12 and up. Contact Teen Librarian Amy Albrect at (972) 219-3400 or visit http://blusponge.blogspot.com for more information. 1st and 3rd Monday of each month, 6 pm - 8:30 pm. These are library events that have passed, but those libraries may be hosting new RPG events. Contact them for more information. Wilmington Memorial Library Wilmington, MA Teen Fantasy Gaming Group -Whether you play Magic: The Gathering, Dungeons & Dragons, or something else, join this popular group and be part of a self-contained fantasy game. Call (978) 658-2967 for details. 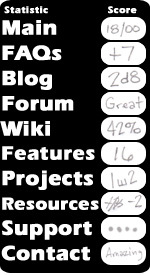 Nov. 10, 2009 - 3 p.m. Teen Game Night - includes Dungeons & Dragons. Contact: (585) 359-7092 Jan. 28, 2008 - 6:30-8 p.m.
Watertown Free Public Library Watertown, MA Dungeons & Dragons tournament. Sign up at the Teen desk. 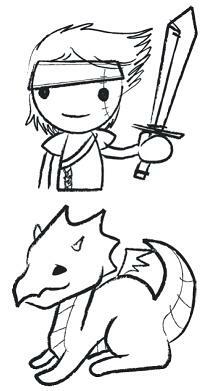 Contact: (617) 972-6431 Jan. 10, 2008 - 2 p.m.
Selby Library Sarasota, FL Teens can make new friends and share with others their passion for role-playing games including Dungeons & Dragons. Equipment not necessary. Weekly participation encouraged and college students welcomed. Recommended for ages 13-up. Contact: (941) 861-5000 Nov. 29 - Dec. 27, 2008 - 12-4 p.m.
Kansas City Library (Plaza Branch) Mansas City, MO Dungeons & Dragons: Open Games - Join us for this classic role playing game. Together we storm the castles, grapple the monsters, sneak attack the unaware, and look good doing it! Contact: (816)701-3481 Dec. 03, 2008 - 5 p.m.